George Klein | The Fantastic Flame On! Today’s Flame On is set in piratical times, as the three male members of the team have stepped through Doctor Doom’s time platform to claim Blackbeard’s treasure (which, let’s face it, is a pretty inauspicious start for one of the Marvel universe’s heaviest hitters). Having been forcibly recruited to the crew of a pirate ship, the team cut loose to fight for their freedom. Here, Johnny activates his flame powers to melt a pirate’s sword, much to his surprise. I really enjoy Kirby’s layouts of the transitions, and the way they mirror each other. In both triptychs, the eyes are the key element and focus of the panels. 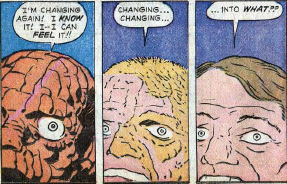 In the first, they change from the unnaturally round eyes of The Thing to the more natural shape of Ben Grimm’s. In the second, they eyes vanish as Ben becomes The Thing again, highlighting the loss of his physical humanity. One of my favourite conceits about the Marvel universe is the way that Marvel Comics themselves exist in their own universe. The general setup is that Marvel heroes license their images and adventures to Marvel Comics, who then publish comics based on these, which are usually almost completely identical to the ones we read. 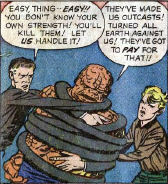 There have been some wonderful stories involving this across the years, a particular favourite of mine being The Thing #7 from 1984, where Ben heads over to the Marvel bullpen to protest the poor nature of one of his issues. So, every now and again, we’re going to see Marvel Comics in The Fantastic Four, and we’ll take a look at them as they appear. 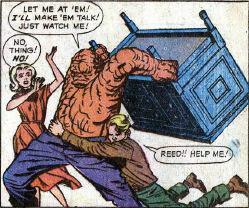 Here, Reed brings along some comics with him when he visits the Skrull spaceship, and manages to pass them off as surveillance intelligence and, incredibly, averts an alien invasion! The art of Kirby and Ditko has arguably never been so important! Anyway, even though these are the first time that these classic words are used, the fact that a damn dirty Skrull says them means that they only get a .1 tally. It’ll be a little while more before we see Johnny use them as his traditional battle cry. 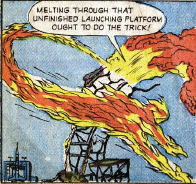 I think this is most extreme example of Property Damage that we’ve seen to date: The Human Torch destroys a missile launching platform at an army base. Now, this is all part of Johnny’s half-baked plan to draw out the Skrull imposters by pretending to be one of them, allowing him to infiltrate them. Of course, his plan requires that the Skrull impersonating him has gone off on his own for a while, or else he’s just the Human Torch acting badly. But not too badly… note that Johnny destroys an unfinished launching platform. That’s still going to be at great cost to tax payer. your tax dollars, funding silly plans to draw out shape-shifting alien invaders. One of the great joys of having a member of your cast who can change his body shape must be getting to let your imagination run wild with the artistic possibilities of such a character. The first time I came across this type of power coupled with a writer and artist capable of running with these possibilities came when I read Grant Morrison and Howard Porter’s JLA, back in the late 1990s. They had an absolute ball with Plastic Man, and for a large part of the 2000s, successive writers and artists kept Plastic Man as an amusing and inventive character within the League. But we’re not here to talk about the Justice League. We’re here, under this category, to take a look at how Stan and Jack handled the possibilities of such a character. We start here, with Mr Fantastic contained in another seemingly escape-proof cell by the US Army. On the previous page we’d seen him use his fingers to probe ever inch of his cell looking for a gap, and here we find him squeezing through a minuscule gap adjacent to a rivet. This leads to this marvellous visual of a plaid-clad Reed sprouting his head from a metal wall. Oh, and notice that this is before the unstable molecule costumes that would make their début in the next issue. That’s an impressive plaid shirt!